​​ By Rafael Zambrana with Karen Hudes January 2, 2015. Transition from paper currencies to national currencies out of gold from the world's gold that went into hiding at the end of World War II. Local villages will issue their own local currencies. After the October/7/2013 attempt to nuke Charleston, the US military stopped taking orders from the network of global corporate control. For those of us who are aware of the reckless behavior the CABAL, (or as Karen Hudes calls them "the Financial Cartel" of families) that have been stealing from humanity the wealth we have been producing for the last 300 years, it is sobering to know perhaps we won't have to go through the CRASH that has been planned by these psychopaths, in order to create the panic for many people and countries accept THEIR solution to the problem they are creating. We are ENSLAVED by the Fraudulent Fractional Reserve Banking System we are forced to use by this nefarious CABAL of psychopaths who have made a custom to produce in DEBT, the Money Supply of almost every country in the world, including the US dollar, the Euro and many other currencies. 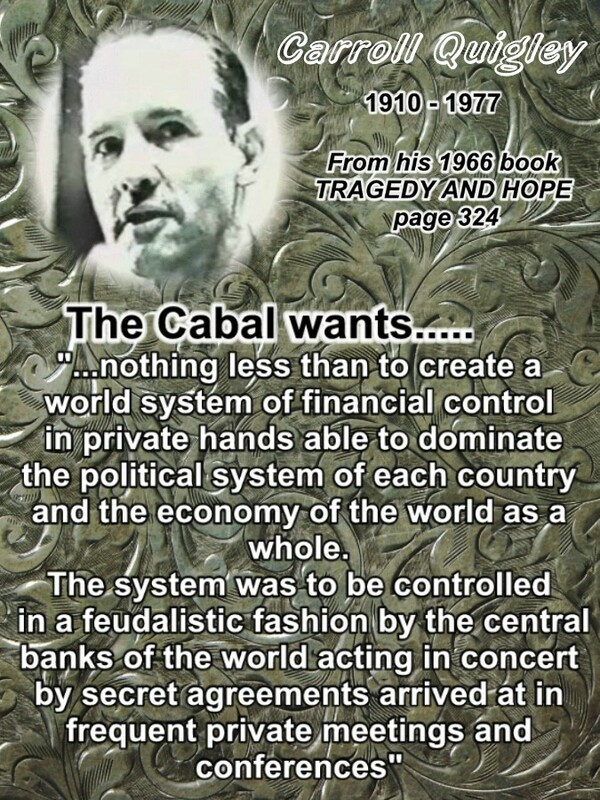 Since this system allows them to create out of nothing the money they use, they PURCHASE any politician, and manipulate any economy to go up or down according to their agenda, and through it in fact control the world and have turned "elected" Prime Ministers and Presidents into THEIR servants, to further the CABAL'S goals, even using National Armies to make wars. The Ukraine conflict is the latest attempt by this CABAL to expand their reach even further by forcing their main obstacles, Russia and the BRICS countries, to step aside so they can control Russia's Central Bank to crash the US dollar and introduce a "new" currency to be shared by many countries, just as the Euro has been in Europe. The Euro has been an "experiment" to see how they would control the one the have ready called SDR produced by the IMF and the BIS in Switzerland as explained HERE. They have called this action "SDR's and the New Bretton Woods agreement" in order to appeal to the trust people have for the original agreement in 1944 that has been active all these years. However, it seems Karen Hudes and the coalition she has gathered, from Generals in the Pentagon, to Generals in the Kremlin and Begin, this criminal control is finally being taken from the Banksters. So much deceit has been dished out for so long, through the Corporate Media, politicians from all parties and countries, and confused people OnLine, it is hard to assess what really is going on, but I sure hope Hudes is correct and her actions bring a peaceful stop to this madness.